Getting windswept is all part of the day! And when you are marrying two people so obviously in love with not only each other, but with life itself, well, that’s a very small price to pay! 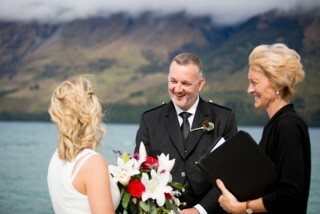 Eva and Stuart travelled from London to marry at the infamous Glenorchy Jetty. But before arriving in Queenstown, they travelled New Zealand on a very cruisy touring motorbike. Eva’s from Hungary and Stuart’s from Scotland and together they live in the UK. And eloping to the far flung shores of down under is one of the highlights of their time together. Let’s hope we see them again one day soon. ← Julie & Alan and the butterfly wedding!